1.1 Northeast Monsoon conditions prevailed in December 2016. These conditions brought dry weather conditions interspersed with brief periods of showers to most parts of the northern ASEAN region. On the other hand, with the gradual southward migration of the monsoon rain band, the Northeast Monsoon brought wet weather conditions to the southern ASEAN region. The rainfall distribution for December 2016 is shown in Figure 1. Figure 1: Daily average rainfall for the ASEAN region in December 2016. (Source: JAXA Global Satellite Mapping of Precipitation). Figure 2: Percentage of Normal Rainfall for December 2016. The rainfall data may be less representative for areas with low density of rainfall network. 1.2 For December 2016, above-normal rainfall was recorded in southern Thailand, Vietnam and the Philippines while rainfall was below-normal in Myanmar, central Thailand, parts of Lao PDR and northern Vietnam. 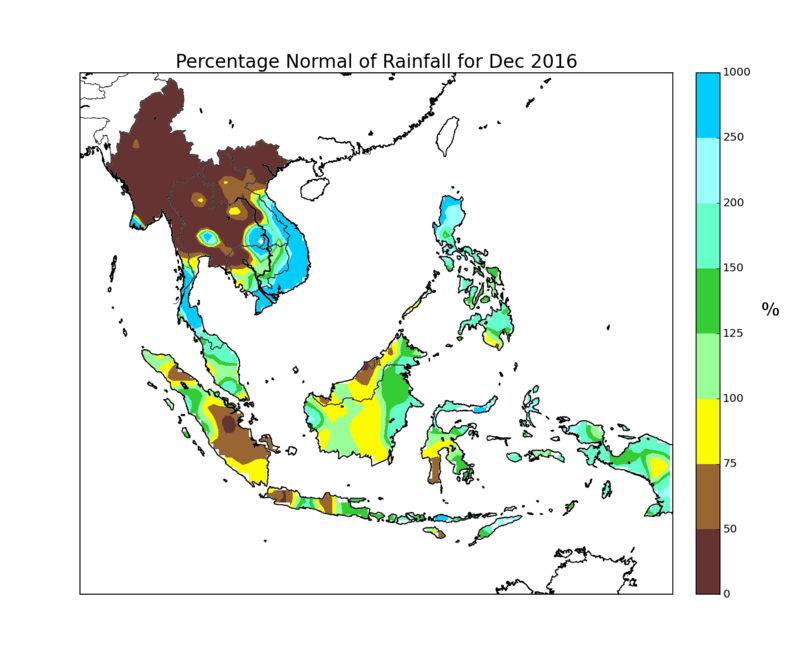 In the southern ASEAN region, rainfall was near-normal in most regions except in central Sumatra and western Java, where below-normal rainfall was recorded. The percentage normal of rainfall for December 2016 is shown in Figure 2. 1.3 The rainfall in December 2016 was distributed mainly in the equatorial region between 10N and 15S with several areas affected by heavy rainfall. A few northeast monsoon surges in December 2016 brought heavy rains to southern Thailand, central and southern parts of Vietnam and the east coast of Peninsular Malaysia. In addition, the presence of a low pressure system over the South China Sea in mid-December 2016 brought well above normal rainfall to the central and southern parts of Vietnam. 1.4 Over the Western Pacific Ocean, Typhoon Nock-Ten was first categorised as a tropical storm on 22 December 2016. It intensified further and tracked west-north-westward toward central Philippines before it made landfall on the eastern coast near Catanduanes Island on 25 December 2016. The typhoon then tracked westward and brought heavy rains and strong winds to the regions of Bikon and Calabarzon in central Philippines. ”Nock-Ten” moved over the South China Sea on 26 December and rapidly weakened into a tropical depression the next day. 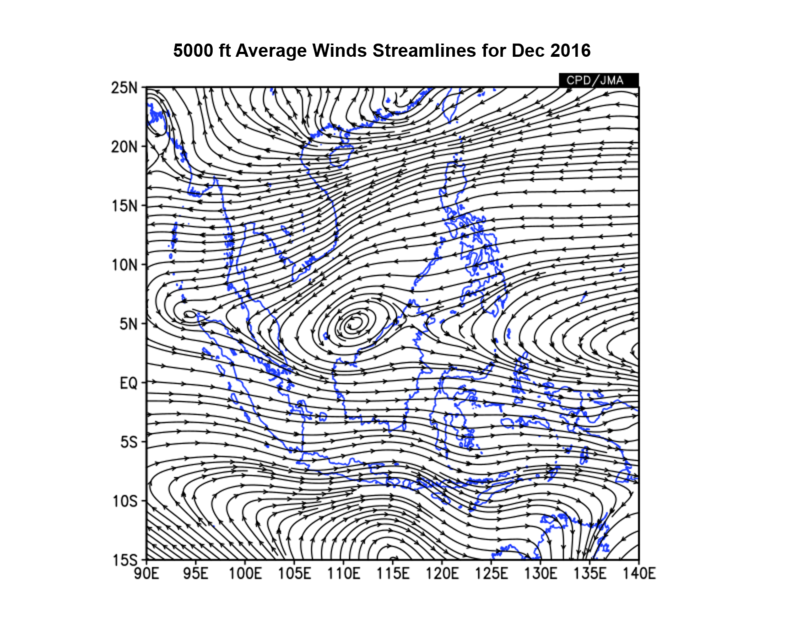 1.5 In December 2016, the average and anomalous winds at 5000 feet (as in Figure 3), showed that north-easterly winds prevailing in the northern ASEAN region while westerlies prevailed in the southern ASEAN region. In the equatorial region of South China Sea, a cyclonic circulation was observed off the west coast of Sarawak and Sabah. This was due to the formation of Borneo vortices on some days in December, a feature which is typical during the Northeast Monsoon. The anomaly wind chart suggests that the anomalous circulation off the coast of southern Thailand is likely to be the primary cause of the well-above normal rainfall received in that region. The easterly anomaly brought below normal rainfall to most parts of the northern ASEAN region. Large-scale and persistent westerly anomaly winds observed across the equatorial region between 5 N and 10 S inhibited the incursion of the prevailing north-easterly flow across the equatorial region, contributing to the reduction of shower activities over Sumatra and parts of Java. 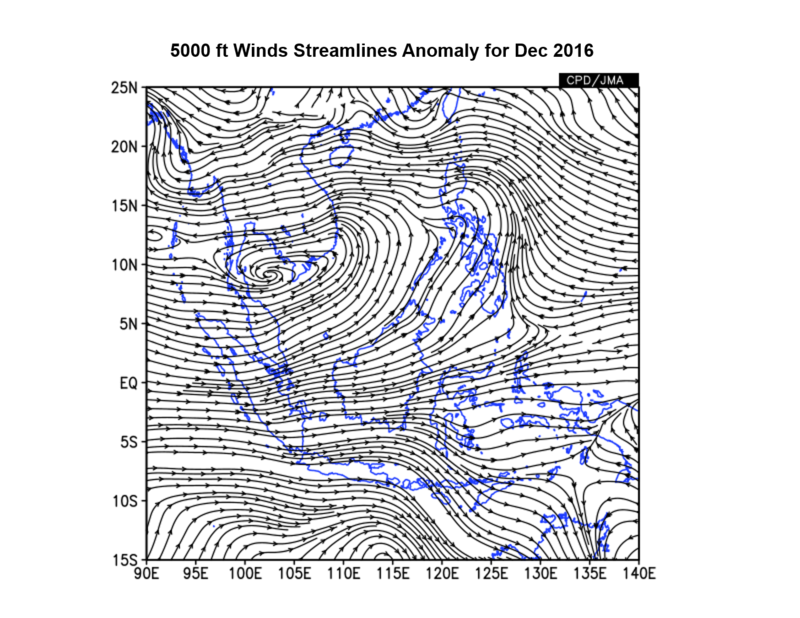 Figure 3: 5000 ft average winds streamlines (left) and anomaly (right) for December 2016. 1.6 In December 2016, the equatorial Pacific Ocean’s sea surface temperature (SST) over the Nino 3.4 region was near weak La Niña threshold values. However, the atmospheric variables, such as trade winds and cloudiness over the equatorial Pacific, showed conditions that were more consistent with neutral ENSO conditions. 1.7 In December 2016, the Madden Julian Oscillation (MJO) was weak or indiscernible and is unlikely to have significantly influenced the weather over the region. 2.1 In December 2016, dry weather conditions interspersed with brief periods of showers prevailed in the Mekong sub-region. This led to a gradual increase of hotspots detected in most parts of the northern ASEAN region. However, the hotspots were mostly short-lived and the smoke haze observed was localised. 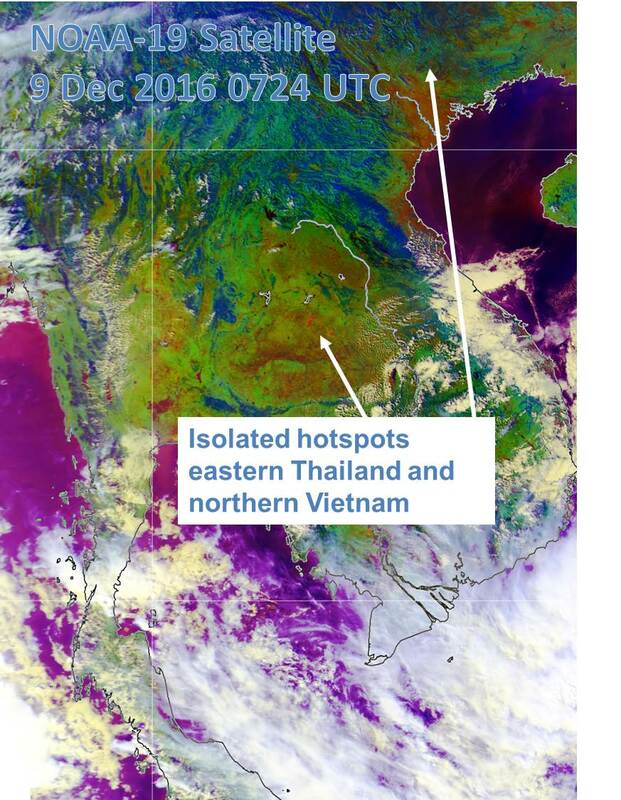 2.2 In the southern ASEAN region, hotspot activities were subdued by shower activities, except in central Sumatra where drier than usual weather conditions emerged. 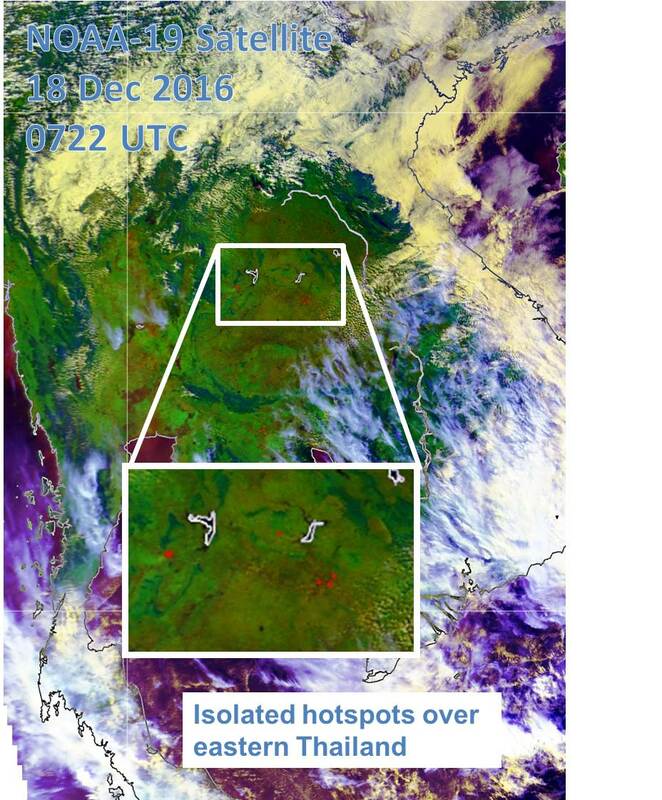 Nonetheless, the hotspots did not persist or give rise to the emission of significant smoke haze.2.3 Satellite images depicting some of the hotspot activities over parts of the ASEAN region during December 2016 are shown in Figure 5 – Figure 9. Fig. 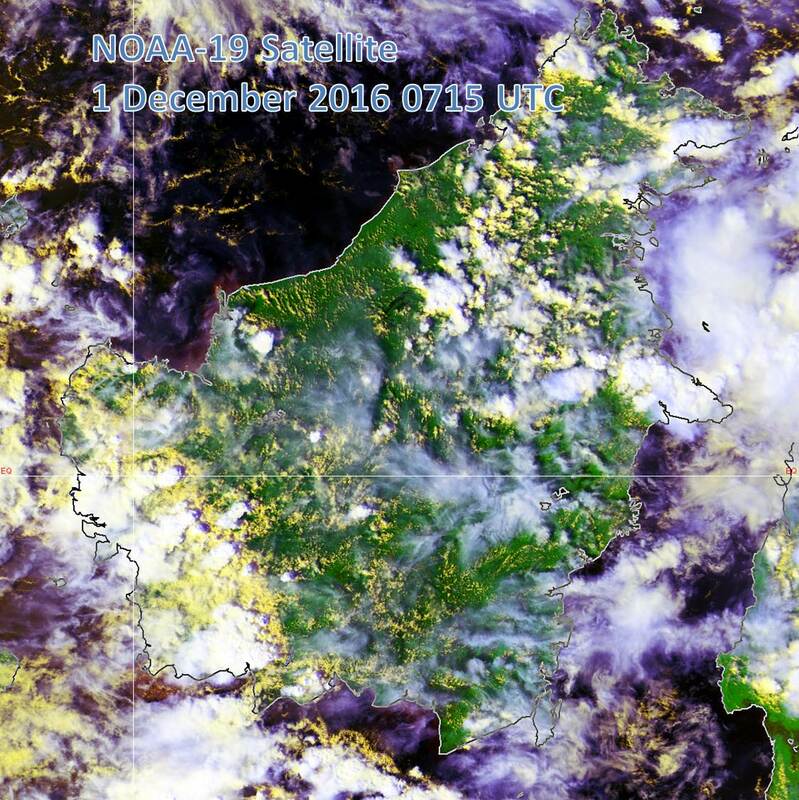 5: NOAA-19 satellite image on 1 December 2016 shows hotspots subdued as wet weather conditions prevailed over Kalimantan. Fig. 6: NOAA-19 satellite image on 9 December 2016 shows isolated hotspots began to emerge in the northern ASEAN region, particularly over eastern Thailand and northern Vietnam. 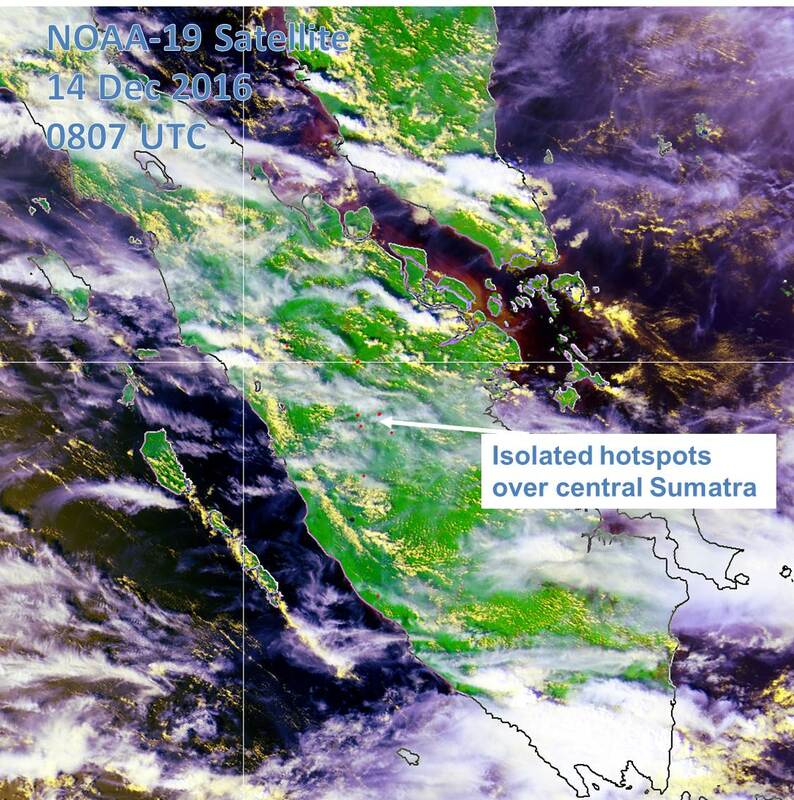 Figure 7: NOAA-19 satellite image on 14 December 2016 shows isolated hotspots detected in central Sumatra. Figure 8: NOAA-19 satellite image on 18 December 2016 shows isolated hotspots detected in eastern Thailand. Figure 9: NOAA-19 satellite image on 23 December 2016 shows isolated hotspots detected in the surrounding region of Yangon, Myanmar. 2.4 The hotspot distribution charts and daily hotspot charts for December 2016 are shown in Figure 10, Figure 11 and Figure 12 respectively. 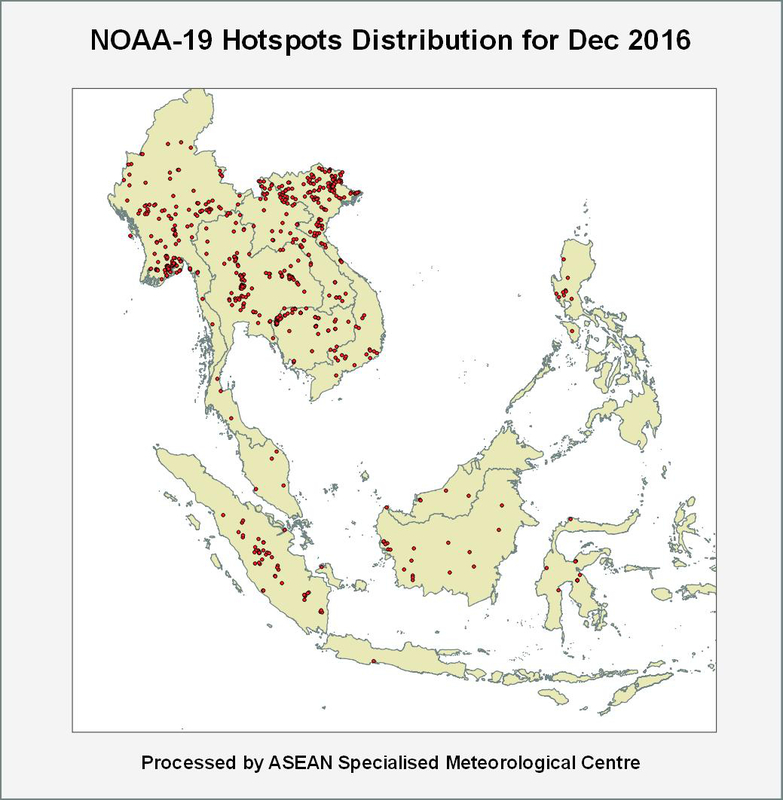 2.5 Most of the hotspots detected in December 2016 were mainly in the northern ASEAN region, with several clusters found in the coastal region of Myanmar, central Thailand and northern Vietnam (as shown in Figure 10). In the southern ASEAN region, the number of hotspots detected remained low except in central Sumatra where few clusters of hotspots were detected. 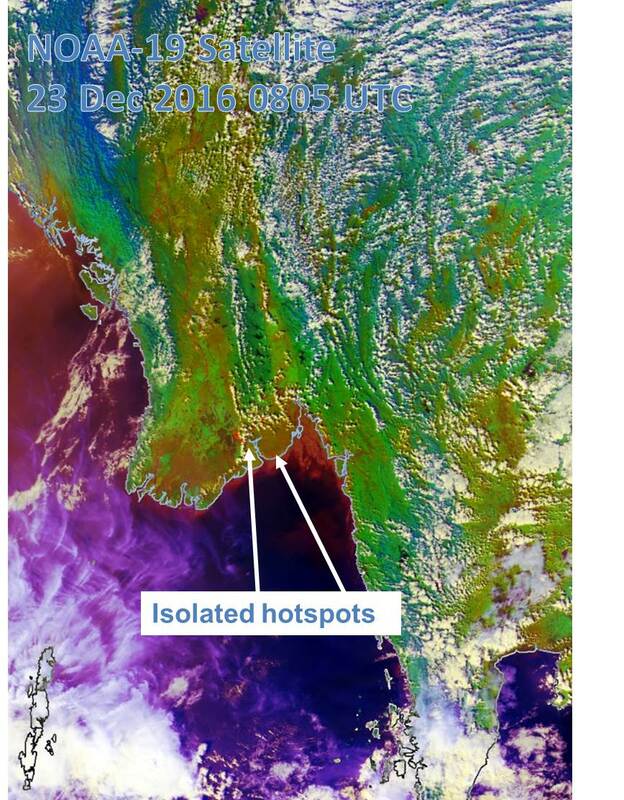 Figure 10: Figure 10: NOAA-19 hotspots distribution in December 2016. 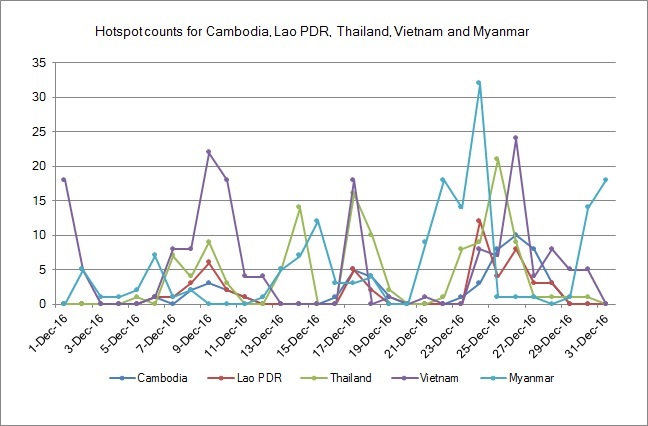 Figure 11: Hotspot Counts in Cambodia, Lao PDR, Thailand, Vietnam and Myanmar in December 2016. 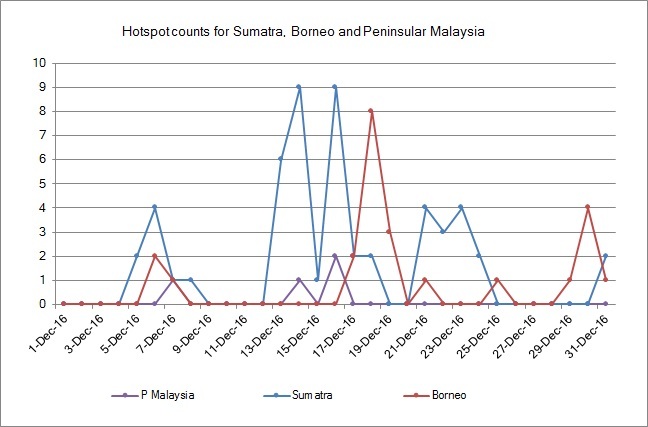 Figure 12: Hotspot Counts in Sumatra, Borneo and Peninsular Malaysia in December 2016. 3.1 Climate models from major climate centres are expecting the borderline La Niña conditions to weaken to neutral conditions in the upcoming season. The neutral conditions are forecast to then persist till mid-2017. 3.3 The Indian Ocean Dipole (IOD) continued to remain at neutral levels, as shown in Figure 13. International climate models indicate that the IOD is expected to remain in neutral condition and is unlikely to have a significant influence on the weather over the region for the next few months. The formation of IOD typically starts around May or June, and peaks between August and October before decaying rapidly between December and April. 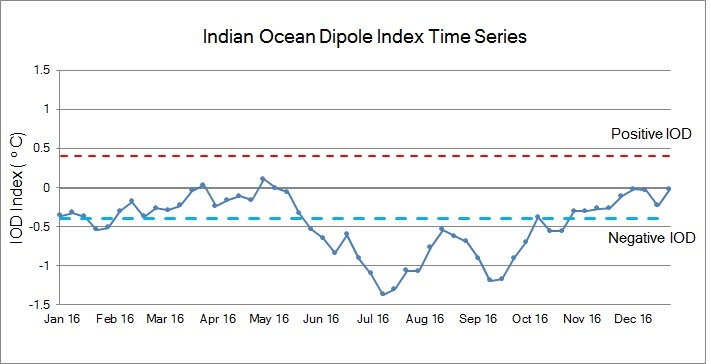 Figure 13: Indian Ocean Dipole (IOD) index time series. The IOD index is at the neutral level for December 2016. (Source: Bureau of Meteorology).